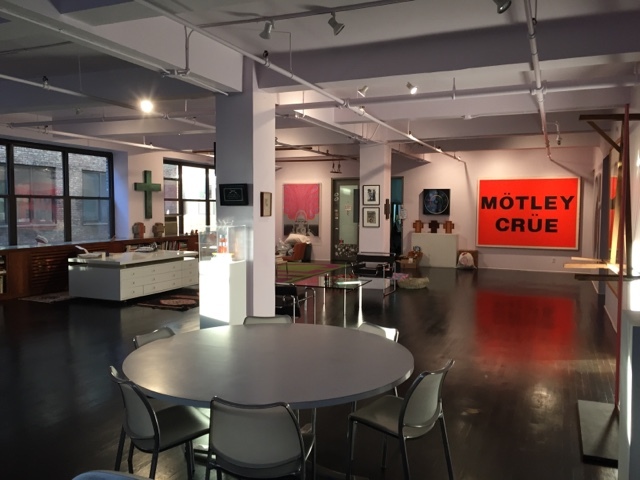 V Findlay Wolfe BLOG: Home in NYC. My kitchen got the biggest clean out. I do not have a large kitchen, so things get pileup on my counters. After a while, I'm left with very little work area... So, now, I'm set to go. Dust bunnies, be gone! I collect cookbooks to read like novels. Crazy, I know, but I love cooking and food as much as I love quilting! So as an hour of rest, I choose two cookbooks, and two cooking magazines, to sit down with and post it note, a whole bunch of recipes. I get so many comments from people saying, "How do you get it all done?" 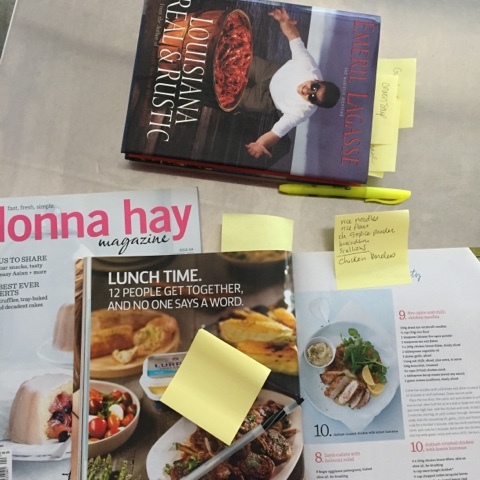 I post-it-note about 20 new recipes in a few random cookbooks. On the post-it-note, I write out the shopping list. I look for recipes that sound fast, delicious, and for things I know I will often have on hand. Now, when I'm ready to make the recipe, I grab the shopping list and go get the extra ingredients I don't have. Saves me tons of time, and I can revisit the many, many cookbooks I have, and actually put them to use. That hour is my sit-down-and-relax time. A cookbook to me, is like sitting down to read a magazine... I enjoy finding new recipes that I can share with my family. Thankfully I left it clean, before I went to Texas. So it's been sitting here waiting for me! I moved a few things around, updated my fabric storage with a console table, taken out of my home,(sits on top of my fabric unit) and bought two new desks from IKEA. This also gives me more room for my jukiQVP 2200 sit down machine. I can now walk easily around the tables and the QVP, to get to my design walls. I still have boxes of "stuff" (for a lack of a better word...) crammed under my JUKI long arm. Friends will soon be asked to come "dig and take" :-) ...The fastest way to declutter my studio! I'm off to do some school shopping today, and to just enjoy this beautiful September day. I hope you do the same! Thanks for the peek inside. :) Have fun school shopping. Victoria, thanks for inspiring me to do the same. I love your idea regarding the cookbooks and post it notes. I too love cooking, baking and FOOD, as much as quilting! Have a great Labor Day! Thanks for the quick tour and hints. I am going to try the recipe approach for sure. I love flipping through my cookbooks and magazines but adding the lists is a very clever trick! Have a great day! Love your idea of putting ingredients you need on the postits - that might help at our house too! Love the post it idea! I cook from scratch for everything (lots of food allergies so it's not optional). Having those lists ready would be awesome! Thanks for the great idea. I love that I'm not alone in reading cookbooks... YAY!! Ah, love to view your work areas, looking good! So envious of your enormous studio. 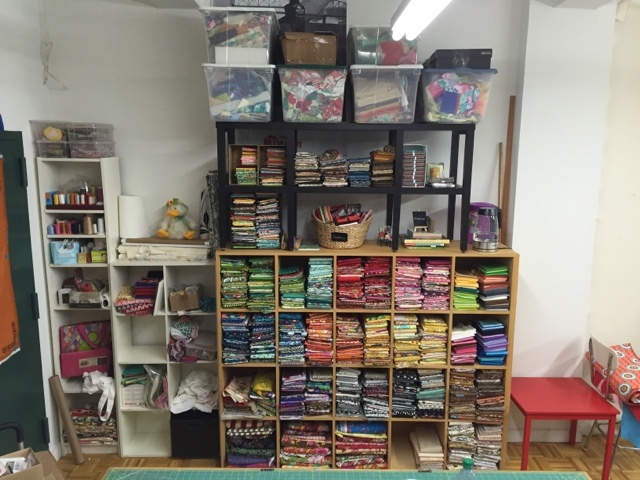 Looks like you're ready to produce some awesome new quilts this fall, look forward to seeing them! Being only 5'1" tall I have to laugh at how high up your kitchen cupboards are and how high you stack things in your studio. I'm sure you can reach all of it. I read cookbooks and food magazines for leisure, too - I may even have more of them than quilting books and magazines??? I recycle envelopes for my shopping lists but my sister-in-law has a small whiteboard in her kitchen for her shopping list and takes a picture with her phone before she heads out the door. I thought that was an idea worth sharing. 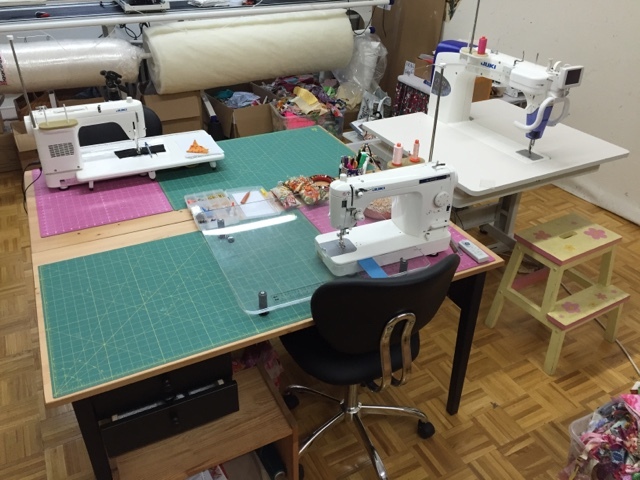 A great studio space and I love the central set up for your sewing area. What a clever way with your cook books, I'm certainly to try and follow your example - and hope it works for my time saving! As an Australian, I'm very impressed to see you reading (and hopefully cooking out of) the Donna Hay magazine! 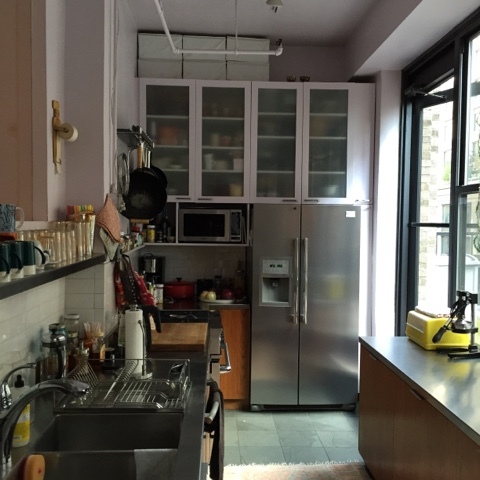 Also I love your apartment, even if the kitchen is a little small. You are a gal who gets things done! Thanks for the fun tour. You are making a great start for fall, your spaces look great. Wow! Everything is sparkling! Do you like any cooking show? As someone who will be taking delivery very soon of a sit-down Juki 2200, I enjoyed seeing yours setup. 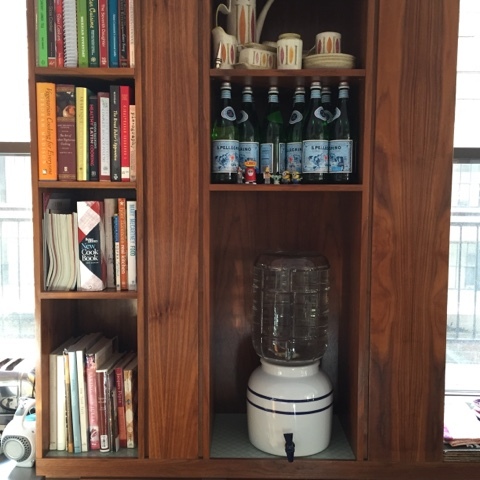 About the recipes...yes, I too love to sit down with a new cookbook (from the library!) 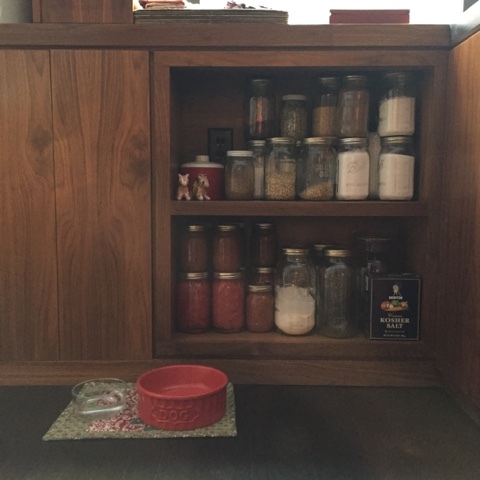 to find a new recipe or two. I sticky-tab the pages, then look up the recipe online. Most can be found on blogs. I then 'clip' them to Evernote where I keep two notebooks: My Recipes and Recipes to Try. If an ingredient is something I don't keep in stock, I capitalize that ingredient. I put this week's menu in the Shortcuts to easily find them. If something is on sale at the grocery, I can search for all recipes with that word and then I know what else to buy...its all on my phone. I LOVE EVERNOTE!! Enjoy the sit down 2200!!! I've tried putting stuff on my phone, I can't keep it all straight... Need that visual reminder, sitting on my kitchen counter... LOL. Well done you! Happy cooking and sewing. Have you looked at eatyourbooks.com You enter all your books (you can get a scanner app) then when you want to try, say, scones, it tells you all your books, magazines, and blogs that have scones. When you put in magazines, it automatically includes the next issue when it's released if you subscribe. It's not the recipes it the indexes. I have about 300 books (I read them also). It's fantastic. I can also go look at the books my girlfriend has so we can plan a menu together.